Long Beach, California, May 12, 2012 – The United States, the defending Olympic Games champion, earned the right to return to defend its men’s volleyball title with a 28-26, 25-18, 25-20 gold-medal victory over Canada on Saturday evening during the NORCECA Men’s Continental Olympic Qualification Tournament that started on May 7 in Long Beach, Calif. The eight-team tournament awarded the winner berth into the Olympic Games later this summer in London. 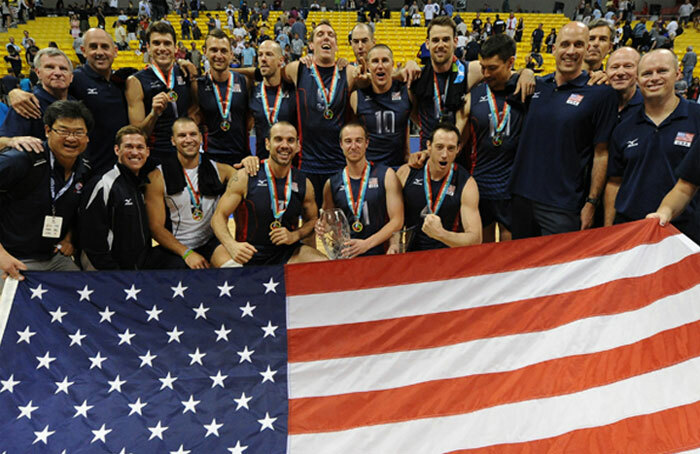 The USA, ranked sixth in the latest FIVB World ranking compared to Canada’s No. 18 ranking, has now qualified for each of the last four Olympic Games through the NORCECA Men’s Continental Olympic Qualification Tournament. However, the 2012 event marks the first time the Americans have qualified on USA soil as a sell-out crowd watched the gold-medal match. Clay Stanley turned in a USA-high 15 points as his team used a balanced offense. David Lee provided 13 points and Matt Anderson each contributed 13 points, while Reid Priddy contributed 12 points. Canada was led by Dallas Soonias’ 19 points, followed by Fred Winters’ 12 points. USA managed a 47-37 advantage in attack points, in addition to an 11-5 margin in blocks. USA overcame a 17-16 deficit in the first set to take a 19-17 advantage leading to a Canada timeout. After trading several points, Canada knotted the set at 22-all with back-to-back points going into a USA timeout. Reid Priddy hammered consecutive spikes for the final two points of a 28-26 first set victory in which the USA had four set-point opportunities. David Lee finished with eight points in the set and five Americans totaled at least three points. Canada was led by Dallas Soonias’ 10 points. USA scored three answered points to grab a 4-2 margin in the second set, then went up 8-3 at the first technical timeout on a Clay Stanley ace and Holmes quick attack. Canada closed to within two at 10-8 after an Adam Kaminski ace off the net. Stanley and Lee put up consecutive blocks to push the USA lead to four at 13-9 going into a Canada timeout. Stanley served an ace for the USA to go into the second technical timeout leading 16-11. The USA never relented in the set and forged to a 25-18 victory. Stanley totaled eight points in the set as the USA had three aces and three blocks in the set. Canada reached the third set’s first technical timeout leading 8-6, only to have the USA level the score at 9-all. Priddy put up a block to swing the advantage to the USA at 11-10 and Canada hit long on the next point creating a timeout at 12-10. USA built a 19-13 advantage on four unanswered points, but Canada scored four of the next five points to slice the deficit to 20-17. The USA held on down the stretch to win 25-20 capped by consecutive Matt Anderson kills.